Count along and you will see how wonderfully God made me! Freckles, fingers, toes, and nosethis delightful counting board book helps toddlers recognize parts of the wonderful bodies God gave us. Count from 1 to 10, and then start over again, thanking God along the way! In the Little Words Matter board books, it only takes a few words to tell a big story. 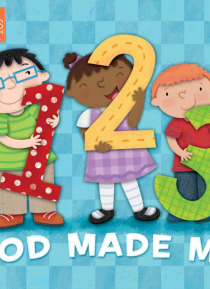 Crafted especially for toddlers, these book… s make biblical truths easily understandable and enjoyable for little ones and their parents too!